Type 2 diabetes is a lifelong metabolic disorder characterized by high levels of glucose or sugar in the blood. 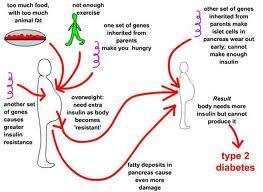 Type 1 diabetes is when the body does not generate sufficient insulin. 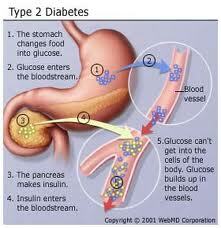 Type 2 diabetes is when the cells do not respond to insulin. Diabetes type 2 is the most common type of diabetes and affects 90-95% of diabetics. It is characterized by insulin resistance or a defective response by the cells to insulin. In some cases, production of insulin by the pancreas may be reduced. Glucose or blood sugar provides fuel for the cells in the body. Insulin is responsible for transporting glucose from the bloodstream into the cells. When insulin cannot move the glucose into the cells, glucose accumulates in the blood and can cause diabetes complications such as damage to the nerves, kidneys, cardiovascular system and vision. Type 2 diabetes is primarily caused by lifestyle factors and genetics. 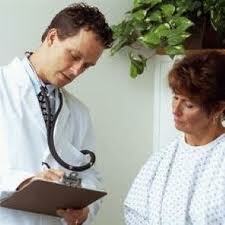 A sedentary lifestyle, obesity, and a diet high in carbohydrates and sweets are the most common causes of diabetes 2. 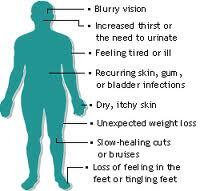 The usual symptoms of diabetes are increased frequency of urination, increased thirst, and increased hunger. People who have diabetes may also lose weight for no apparent reason. When left untreated, diabetes can result in vision damage. Prolonged high levels of glucose in the blood can cause glucose absorption in the lens of the eye, resulting in changes in its shape leading to blurred vision. Other symptom of diabetes are skin rashes and wounds that heal very slowly. Type 2 diabetes is a chronic disease with no known cure. As such, “treatment” may be a misnomer. A better term might be “management” of the disease. Management focuses on keeping blood glucose levels as close as possible to normal. 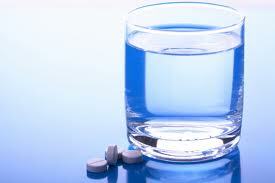 If you are diagnosed with diabetes type 2, your doctor may prescribe some form of medication. Diet and exercise are also important in controlling type 2 diabetes. Recent studies show that type 2 diabetes can be successfully managed without the need for medications. A healthy diet that is low in carbohydrates and high in fiber, protein, wholegrain cereals, dairy products, fruits and vegetables can keep blood sugar at normal or near-normal levels. The right diet and exercise help diabetics manage their blood sugar levels and prevent or reduce complications of diabetes such as blindness, kidney damage, nerve damage, and heart disease. An experimental drug improves patients’ blood sugar control without increasing the risk of low blood sugar (hypoglycemia) in patients with type 2 diabetes, according to the results of a phase 2 clinical trial. 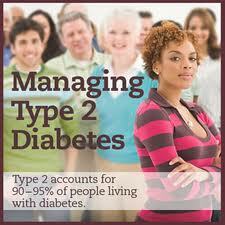 Type 2 diabetes is the more prevalent form of the disease, accounting for about 90 percent of cases. Often tied to obesity, type 2 diabetes involves a gradual decline in how insulin responds to changes in blood sugar (glucose). The new drug, called TAK-875, is a pill designed to enhance the secretion of insulin in response to such changes, which means that it has no effect on insulin secretion when blood sugar levels are normal — potentially reducing the risk for hypoglycemia. The trial, led by Dr. Charles Burant of the University of Michigan Medical School, included 426 patients with type 2 diabetes who were not getting adequate blood sugar control through diet, exercise or treatment with the first-line diabetes drug metformin. The patients were randomly assigned to receive either TAK-875 (303 patients), placebo (61 patients), or another diabetes drug called glimepiride (brand named Amaryl). 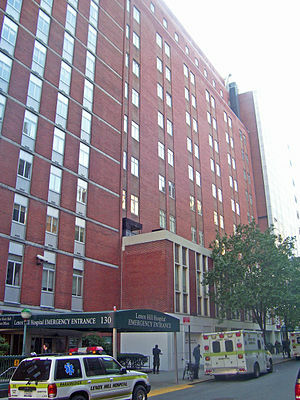 The study was funded by Takeda Pharmaceutical (which is developing the drug), and appears online Feb. 26 in The Lancet. After 12 weeks, all the patients taking the different doses of TAK-875 had significant drops in their blood sugar levels, the researchers said. A similar reduction occurred in patients taking glimepiride. However, the incidence of episodes of hypoglycemia was much lower among patients taking TAK-875 (2 percent) than among those taking glimepiride (19 percent) and the same as those taking the placebo (2 percent). In a journal commentary, Clifford Bailey of Aston University in Birmingham, England, cautioned that, “on the journey to approval of a new class of treatment for type 2 diabetes, many questions will be asked of [drugs such as TAK-875],” including questions of how long they might remain effective, as well as safety issues. Other diabetes experts had mixed views on the new findings. Dr. Loren Wissner Greene is clinical associate professor of endocrinology at NYU Langone Medical Center in New York City. She noted that glitazones — a separate class of newer drugs such as Rezulin, Avandia and Actos that also target insulin resistance — have all shown initial promise in clinical trials before worrisome side effects began to surface in users (Avandia was recently withdrawn from the U.S. market due to heart risks). As for TAK-875, it targets a separate mechanism “but again, until more is known about short-term and long-term cardiovascular effects, we need to proceed with moderated enthusiasm for each new drug and drug mechanism,” Wissner Greene said. The U.S. National Institute of Diabetes and Digestive and Kidney Diseases has more about diabetes medicines. Jan. 27, 2012 — The FDA has given its nod to Bydureon, making it the first weekly treatment for type 2 diabetes, according to drug’s manufacturer. Given as a shot, Bydureon (pronounced by-DUR-ee-on) is the long-acting form of Byetta, a twice-daily injection. It works by stimulating pancreas cells to produce insulin when blood sugar is too high. It is used along with diet and exercise to improve blood sugar control among people with type 2 diabetes, the form of the disease most commonly linked to obesity. The approval marks the third time the FDA has considered Bydureon, which is manufactured by Alkermes PLC and Amylin Pharmaceuticals Inc. Previously the FDA had expressed concerns that it may increase the risk of heart problems. As part of the new approval, Bydureon manufacturers must now conduct a study to determine whether the drug does increase these risks. The approval is based on results from a 24-week study that showed people who used the new drug had greater improvements in their blood sugar with just one dose per week, compared with people treated with Byetta injection. The most common side effects were nausea, diarrhea, headache, vomiting, constipation, itching at the injection site, a small bump at the injection site, and indigestion. I used to be recommended this web site through my cousin. I am not certain whether this publish is written by him as no one else realize such designated approximately my difficulty. You are wonderful! Thanks! Thank you so much, Jody. It’s not a paid theme. I did it myself. I appreciate your encouraging words. Healthy and Happy Holidays to you and yours. It’s not a paid theme. Created it for free myself. Thank you so much for your kind words! Thank you so much. I truly appreciate your support and words of encouragement. Thanks for reading. Glad you find it helpful.